One bit of scenery that keeps cropping up in all of the scenarios I want to play from the Skirmish Campaigns book I'm working through is a Normandy-style barn. I had been looking for a while to find a model I liked, with no luck, and had essentially given up when a new kit from Stronghold Terrain popped up on The Miniatures Page. The photo looked decent, but the company is in Germany and I wasn't super keen on ordering something from that far away. 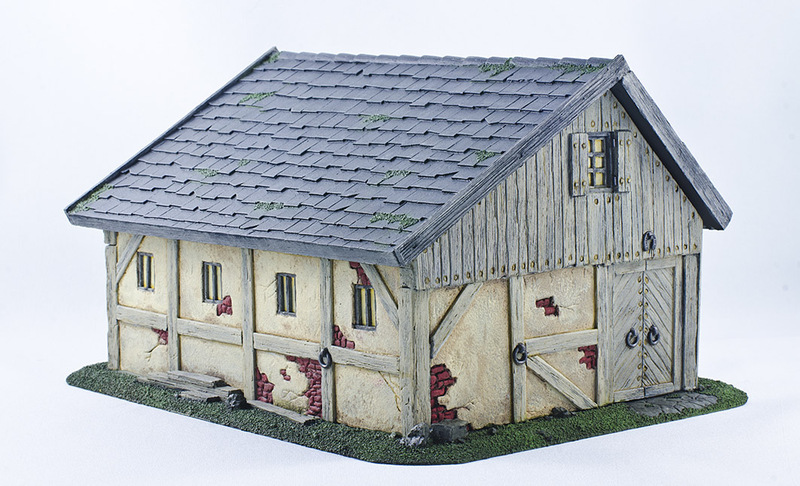 Still, having a proper barn would be better than just using a random, not-at-all-barnlike building from my Mordheim box, so I went for it. 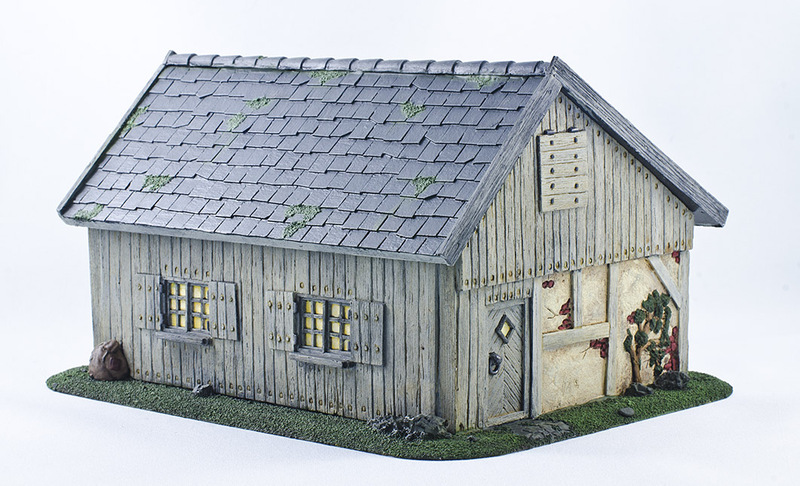 The kit arrived in 7 pieces: a base, 4 walls, and a 2-part roof. The base and walls are cast in what they call "hard stone plaster." It is a heavy, strong, almost cement-like material that feels like stone and is a bit porous, with really nice detail and no casting flaws that I could find. 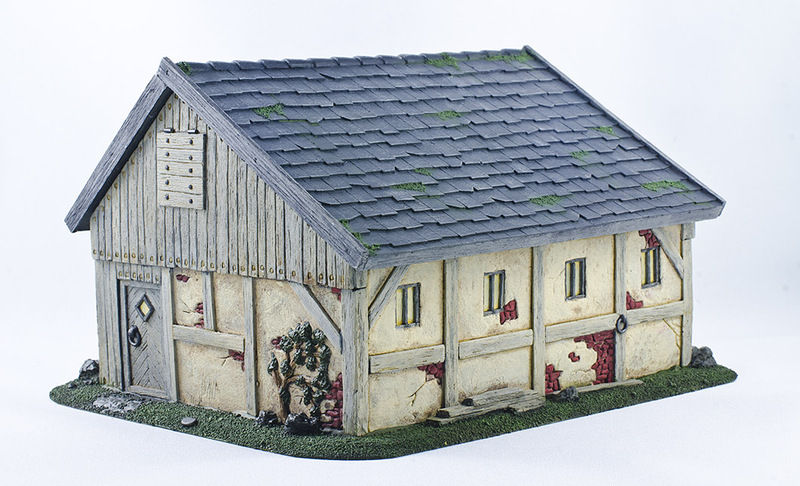 The roof is fairly thick and strong resin, with no casting flaws either. It is detailed on five sides, with the underside just smooth, but nobody is going to look at the underside anyway so who cares. I should add that the stable arrived with a hand-written thank you note and a little baggie of barrels and crates for my "bitsbox." It was a really nice touch. The stable assembled easily, though gluing the two pieces of the roof together at the correct angle took a bit of patience. The walls didn't quite fit perfectly... there's a small gap visible in the corner of the last photo. I don't know if that's a result of the model or my building skills, though. I decided to experiment a bit and tried to get a gray, weathered effect out of the wall boards, rather than the usual brown that I usually paint wood. It felt wrong painting the wood gray, but after a couple of washes I think it turned out really well. There is a lot of detail on the walls, with cracked plaster, bricks, and even a little shrub molded in. The windows and doors are molded in, without actual apertures, but if I was really keen it wouldn't take much to drill / saw / file them out. For my purposes I'm happy to leave them as-is. 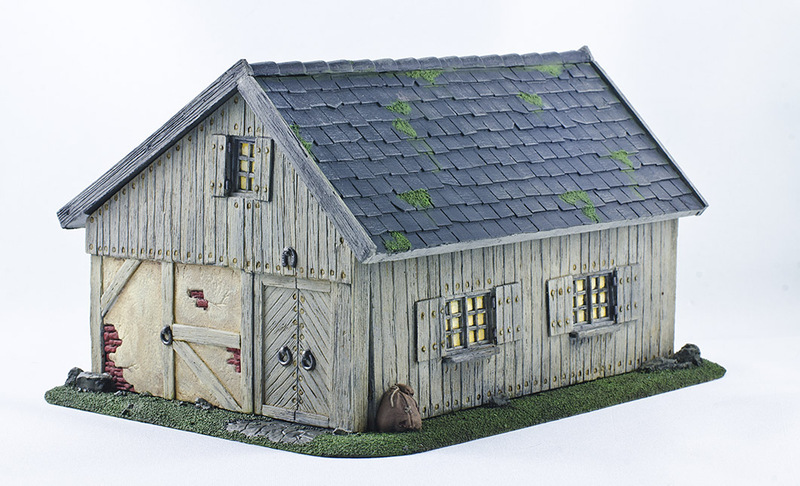 Likewise, there is no internal detail in the stable, but again I don't really care about that. It wouldn't take much to build individual stables out of coffee stir sticks if you needed that. Overall, I am really happy with the Stronghold stable. Good detail, nice materials, a very robust-feeling final product, and great service. That's a lovely piece Cameron and very nice paint job too. Thanks for the review - is it 15mm?